If you are experiencing problems with your MIDI Controller/DJ Hardware not connecting or behaving correctly, there are a few things you can check first which hopefully will ensure successful operation with Serato software. Often overlooked, but the first thing we recommend is testing with several different USB cables to connect your device. Also, certain USB ports on your computer can function better than others. It's good to experiment with ALL ports on your computer before moving on. Now try checking that it is being recognized. If your Operating System is recognizing your controller correctly, then it will more than likely work with your Serato software. When you plug your controller in Windows should search for the drivers automatically (or it will ask your permission to). Some controllers require special software or drivers to run - these maybe on a disc that came with the controller. If you do not have this go to the controller manufacturer's website and find it there. Sometimes Windows can install devices incorrectly. This usually happens when the device is recognized as being something else, other than the expected name of the device. We can check what your computer is recognizing your controller as by going to the Device Manager. Most controllers will show up with the name of the manufacturer or the name of the controller. If you have identified the controller in either of these lists and it shows up as something else, right-click on it and select uninstall. Now unplug then re-plug the controller to your computer and let Windows search for the drivers again. If it installs the controller incorrectly again, or there is a yellow exclamation mark next to the device logo please start a help thread here and give the moderator a detailed description of your issue and setup. Some MIDI devices require mac drivers. In this case, you should check the manufacturer website for any mac drivers if they are available and install them. Your MIDI device driver should show up as an icon as the example above shows. Sometimes even though this icon is shown in the MIDI Studio, it will not connect first time. You can disconnect your MIDI device and then with your device icon highlighted, select 'Remove Device'. After doing this reconnect the MIDI device and the driver icon for this device should reappear. Now check to see if your device has been recognized. If you have tried everything above but are still having problems then the next step is to check that your MIDI controller is communicating (sending/receiving) MIDI messages with your computer. This is the basic functionality of MIDI and if your controller is not communicating with your computer then it is not going to work. We can check to see if MIDI messages are being communicated between the computer and the MIDI controller quite easily using an application that monitors MIDI messages being sent from a MIDI deviceMIDI monitor. If you are unsuccessful with connection and your controller is not sending MIDI messages, try testing your controller with a different computer by following the steps in this article. This helps to narrow down the cause of the issue. If your controller is still not behaving correctly with a different computer, then it is possible that controller may be faulty. However, if it is working correctly, then further troubleshooting may be required with your computer. Some computers come with their own built-in MIDI monitor program, but for those that don't (or if you are not sure how to use this program), we recommend MIDI-OX. MIDI-OX is a Windows-only MIDI monitoring application that is free and easy to use. Once you have downloaded and installed MIDI-OX open it up and connect your MIDI controller. 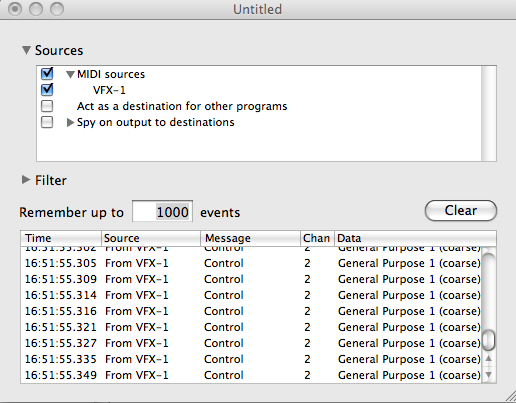 If you get to this point and MIDI-OX gives you an "Undefined External Error" follow the steps here to try and resolve it. Now we need to just check that everything is as it should be. It looks a bit intimidating but its actually quite simple. Press a button on your controller. When you press the button down a MIDI line should come up, when you let go of the button another line should appear. 1. The NOTE is the same for the ON and OFF note. 2. None of the buttons on your controller are sending the same NOTE. This is a common problem and if you can see that more than one button is sending the same note then they will obviously be conflicting. What happens in this scenario is you will map something to that button in Serato DJ then you will map something to the button that sends the same note and then the first button is overwritten. If you have buttons that are sending the same NOTE you will need to change the way your controller is sending notes. Some MIDI controllers have different MIDI modes (like the AKAI MPD range), so you will need to change to a MIDI mode that allows a different MIDI message to be sent from every button. Other MIDI controllers have software that allows you to change this - either way it is best to consult your manual or controller manufacturer on how to change this. 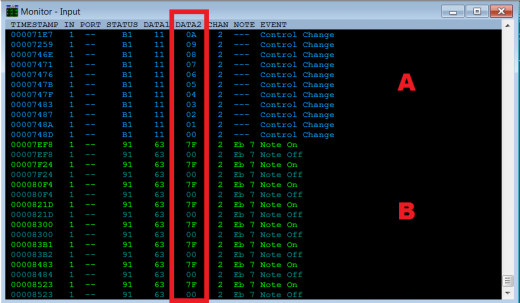 With Endless Rotary knobs (knobs that have no start and end position) you just need to check that MIDI messages are being sent and that the only thing that differs for each message when you twist the knob is the number in the DATA2 column. Some Macs come with their own built-in MIDI monitor program, but for those that don't (or if you are not sure how to use this program), we recommend SNOIZE MIDI MONITOR. Snoize MIDI Monitor is a Mac-only MIDI monitor that is free and easy to use. Once you have downloaded the Snoize MIDI Monitor DMG file, open it up and connect your MIDI controller. By default, the MIDI monitor should already be set to receive MIDI messages from your controller but you may have to click Sources > MIDI Sources and select your MIDI controller from here. As you can see above I have my VFX-1 selected. All the buttons/knobs/faders send a MIDI message. If they don't then your computer and MIDI controller are not communicating at all. Make sure your controller is powered, try using a different USB cord and plugging into a different USB cord, try connecting to another computer and see if it works. That none of your buttons/knobs/faders are sending the same Data (in the Data column).What happens in this scenario is you will map something to that button in Serato DJ then you will map something to the button that sends the same note and then the first button is overwritten. If you have buttons that are sending the same NOTE you will need to change the way your controller is sending notes. Some MIDI controllers have different MIDI modes (like the AKAI MPD range), so you will need to change to a MIDI mode that allows a different MIDI message to be sent from every button. Other MIDI controllers have software that allows you to change this.